Liz looks as though she might have it all worked out. But when a tragedy derails her new relationship, she has some serious decisions to make. Celebrating female friendship, the highs and lows of motherhood, and the lifesaving power of a jumperoo, THE MUMMY LESSONS follows a year of highs and lows for Emily, Molly and Liz as they learn the hardest lesson of all: life doesn’t always follow the rules . . . I received an e-ARC of this book via Netgalley in return for an honest review. 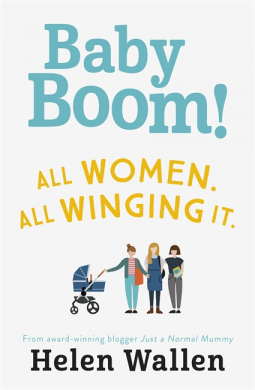 I thoroughly enjoyed Helen Wallen’s first novel, “Baby Boom” so I was really keen to get stuck into book 2, “The Mummy Lesson’s” and find out what Emily, Molly and Liz were up to. I enjoyed the character development between books for Emily and Molly. Becoming a mother changes you in ways that are deeply personal and individual and it was so good to see each woman handle her new role in her own way. Equally, it was nice to see that when all three friends met up their friendships were exactly the same and none of them were left out. As well as the realistic parenting parts of the book, the dramatic storyline added real tension to the plot. Liz is the character I relate to the least and I felt like we got a bit more of her in this book. She became a bit more vulnerable which was really interesting to read. I can’t help but feel like Liz’s story wasn’t completely resolved though, which has left me really hoping that book 3 is in the works! I really recommend Helen Wallen’s books to anyone who enjoys a fun, hilarious contemporary page-turner. You don’t have to be a parent to enjoy these books, there’s plenty of plot and character for everyone to enjoy them. If you are a parent though you’ll laugh at the sheer accuracy of some of the descriptions in these books.